What can you expect at the Nurburgring, Germany? One of the highlights of our banger rallies for many “Motoscapers” is the Nurburgring. So, if you’ve never heard of the Nurburgring, you want to know what to expect right? Well, we don’t want to give too much away as you want to experience it yourself, but here’s our quick guide! 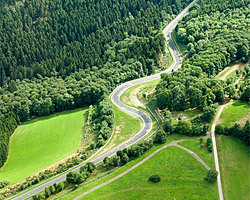 The ring is easily found by the efficient German road network and is definitely worth the effort! Once you arrive at the circuit you will be amazed how accessible the track is, you simply pull up into the car park, buy a ticket (if you wish) from the little booth, put the ticket in the barrier and you are there! A stunning 20km of race circuit ready for you to drive like a star in the reasonably priced car! The only rules are the car has to be road worthy with no bits hanging off or likely to fall off. One of last years teams ended up taping up the plastic pipes on the back of the car with gaffa tape! Could you imagine something like this in the UK, a 20km racing track where you can turn up in pretty much whatever you like and take it round the track for a few Euros and no checks? Our health and safety officials would have a field day. The other thing to bear in mind is to keep to the right and indicate right when cars are approaching just to let them know you have seen them. You also need to have your wits about you, because the Germans love their cars. We’ve seen some amazing cars on all our visits to the Nurburgring, from Porsches, Ferraris, Lamborghinis, Pagani Zondas, and even VW camper van in bright yellow covered in flowers. But these cars don’t compare to the might that is all the Motoscapers taking to the ring in their beloved bangers! Every year this fantastic race track get’s such great feedback on our rallies. You can choose to drive round the circuit as many times as you like or sit back and watch everybody else just visit the circuit’s museum or have a drink in the cafes and restaurants. So are you ready to embark on a lap of what is widely considered the toughest, most dangerous and most demanding purpose-built race track in the world, nicknamed ‘the green hell’ by Jackie Stewart? If so, head over to our registration section and sign up to one of this year’s rallies. It will be a trip you will never forget! We hope you’ve all enjoyed watching these videos as much as we have. It’s great to see teams put this much effort in, to give people chance to watch what it’s like taking part in our rally. If anyone coming on this year’s rallies wants to make a video diary, feel free, we will definitely put it on our youtube page for everyone to see.